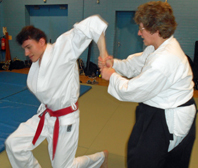 There are a lot of different martial arts and a lot of different Aikido styles and teachers to choose from both in the UK and around the world. So what can you expect when you train at White Oak Aikido Reading? 1. To preserve and honour the Aikido of Haydn Foster Sensei and his lineage back to O Sensei. 2. Through study and training to evolve the Aikido of Haydn Foster Sensei as a living tradition. 3. To keep our Aikido alive and honest through training at seminars with a variety of teachers from different lineages. 4. To teach Aikido which is functional, effective and fun. 5. To base our Aikido teaching on sound basics and principles, and ensure a strong foundation from which each student can develop in their training. 6. 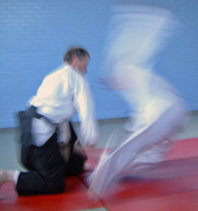 In our teaching and training, to recognise that Aikido is a martial art for both self-defence and self-development. 7. To use Aikido to develop our students and to help them to realise their potential. 8. To create a safe, non-competitive and non-aggressive training environment. 9. To adapt our teaching to individual needs, whilst maintaining high standards in our tuition and grading system, ensuring a consistent, honest and genuine approach with all our students. Of course, the best way to find out what training at White Oak Aikido Reading is all about is to come along to one of our training sessions! New beginners are always welcome to come and watch us training or to join in for a free taster session and to have a chat with the teaching team and any of our members.